4 Eel Fishing: Episode 4 Is Finally Here! After a slew of technical difficulties that delayed the original release date, 4 EEL FISHING Episode 4 is ready for your viewing pleasure. Better get yourself a helmet and install a seat belt in your favorite reclining chair as this is the longest, most intense and strangest comedic fishing show you may ever see. Join all of Kokemachine’s 5 fans and check this baby out! 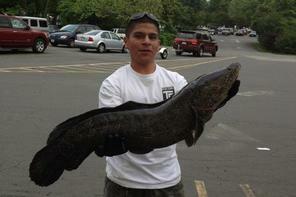 An absolutely massive invasive snakehead has been pulled from the Potomac River by Juan Duran, and he may very well have set a world record! The current record stands at 17.4 pounds, caught in Japan, but Juan’s fish is four feet long, over 18 pounds, and caught in Virginia! Duran’s pictures and scale are on their way to the IGFA for certification as a world record. Asian Carp From Hazard to Hot Dog? “Without them, I think we’d be a dying breed,” said Ron Brown, 64, a commercial fisherman who has worked the waterways of Illinois for decades. Behind him, in a flat-bottom fishing boat, lay his day’s catch — a gooey, 5,000-pound heap of invasive Asian carp. These omnipresent fish rank among the worst environmental threats facing the Midwest, but along the front lines of their invasion, they are sparking an economic mini-boom. The federal government is throwing $50 million at the problem this year, including generous bounties for the fishing industry. Meanwhile, entrepreneurial processors are cashing in on high demand for the fish abroad and placing bets on a burgeoning domestic market. “We basically took a bad fish and turned it into a good fish,” said Lisa McKee, CEO of Big River Fish Corp., a Pearl, Ill., fish processing plant that now owes 80 percent of its business to aquatic invaders infesting long stretches of the Ohio, Illinois and Missouri rivers. Another processor, Schafer Fisheries in Thompson, Ill., sold 30 million pounds of carp last year, much of it ground for fertilizer or sliced into fillets. Although unpopular with Americans, bighead and silver carp are some of the most-consumed meats in China. The plant owner, Michael Schafer, 56, said he hopes to boost his profits by selling foreign buyers on his just-perfected formula for carp baloney and, of all things, carp hot dogs. You might recall the when we posted the original Peoria Carp Hunters video. Well Zachary Hoffman himself emailed me to say they’ve just released the sequel! I hope you brought a clean pair of underwear with you this morning because you’re about to ____ your ____. You’ve been warned! Check out the Peoria Carp Hunters official website for more info.